I have 4 puppies in the house right now. This morning, one of them barked somewhere between 5am and 6am, so I got up because walking downstairs when I’m terribly sleepy and grumpy is less painful than cleaning up a puppy that has smeared himself in pee or poop inside the crate. It was still pitch black outside when I shuffled downstairs and began the morning routine with the puppies. I let them all out of their crates and 2 of the ShihTzus ran right over to the UGODOG and promptly peed. Another had already peed & pooped inside the kennel (thankfully it was the one with a towel in the kennel…but probably having the towel was the reason it went ahead and peed & pooped because there was something to absorb the mess, and somehow puppies know this), so he didn’t go on the UGO because he had already gone. And the 4th puppy began to pee on the floor, but I “Hey’d” him (like Cesar Milan) and quickly picked him up and placed him on the UGO. Of course, by that time, he was distracted and forgot all about needing to pee. I cleaned up the tinkles on the floor then sat down to watch them all like a hawk so there were no more accidents. A couple did go poop, and they all began to play, eat some food, and check each other out after the long night of being crated separately. After a few minutes I began to look around in my tiny space and see if there was anything else I could do that would make me feel like I was actually accomplishing something. I saw some white towels in the washer, so I moved them into the dryer. Then I noticed that my son was not on the couch where he had been just a few minutes before, sleeping, so I quickly stepped over the baby gate, walked a few feet, and peeked into my kids’ bedroom. He was there. I guess he wanted to sleep without listening to puppy noise and seeing a light that was on. I was gone LESS THAN A MINUTE, to check on my kids, and when I came back, 3 of the puppies had pooped. Oh my goodness!! Two poops were on UGO, so I was actually happy about that, because at least 2 of the puppies made that choice on their own without my coaxing. Those 2 puppies had chosen the right spot to poop. But one poop was off to the side…oh well. I quickly cleaned it all up so they wouldn’t accidentally step in each other’s poop, but I was marveling at how quickly they all did their business, and when I wasn’t looking. I thought they had already gotten all their pees and poops out while I was sitting there watching them like a hawk. I guess not. And the moment they were unsupervised, was the moment they decided to use the toilet. It happened SO FAST and it seems those sneaky little buggers waited till I was gone on purpose. The thing is, had I been gone for a full 5 minutes, I could have come back to an absolute disaster area of poop stuck on feet, tracked all over the puppy zone, and an hour-long project of giving puppy baths and mopping the bathroom would have been necessary. It would have been so easy to be distracted for just 5 minutes, but it takes much less than that for a potential disaster to occur. The point of this story is to tell you that puppies need to be supervised at all times when they are out of their crate! It’s so easy to get distracted with something, but believe me, the minute you leave…that will be their cue to get into trouble! I cannot stress how important it is to supervise your puppy, all day long. Compartmentalize his time into chunks of playtime, crate time, potty time, eating time, walking time, etc. Set your timer if you need a reminder when it’s time to take puppy out to potty. Preventing accidents is always a lot easier than cleaning them up after the fact! The puppies are back in their crates with bully sticks. My timer will ring in 15 minutes and it will be time to start the process all over again! And so goes my day! 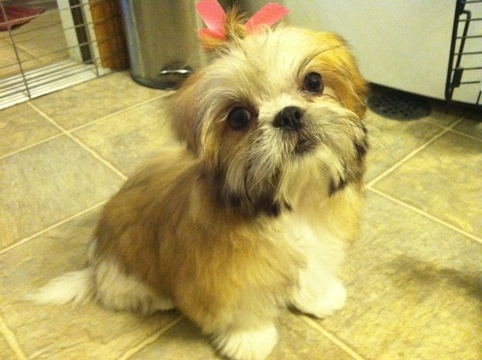 This entry was posted in ShihTzu, Training. Bookmark the permalink.